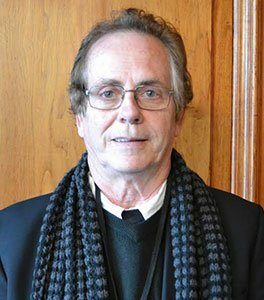 Mr Jan Esterhuizen of the IFP brought a motion forward in parliament to ban Fireworks. Please take some time to email Mr Esterhuizen and pledge your support! We are grateful for this VOICE OF REASON! In terms of fireworks, next year will hopefully be the last year that another or any venue has to be found. As the result of Tracy Edwards (TVRA) spotting that Mr Jan Geldenhuys of the IFP had tabled a motion in Parliament to ban fireworks we have contacted the DA via their Shadow Minister of Police to request that the DA support the motion. The motion was confirmed by Annette Rademeyer who is a DA Councillor in King Williams Town as well as being the Chairman of the NSPCA. By a stroke of good fortune we met Glynnis Breytenbach the DA Shadow Minister of Justice who has forwarded our request to Diane Kohler Barnard and committed to ensuring that they would seek the support of the party for this motion, as the DA were the first, and possibly the only political party to recognise the sentience of animals. The motion tabled by Mr Geldenhuys jumpstarts the matter as there is no longer a need for petitions demanding that Parliament bans the sale of fireworks although there may yet be a time when support can be provided by the the public for the IFP’s. To ban fireworks nationally, that is, changing national legislation at Parliamentary level. Excluded are professional Pyrotechnic displays as this would be unconstitutional since it would have a negative impact upon these specialised businesses. WHY RRSA AS THE VEHICLE? The reason for this is that RRSA does not work directly with animals which will help alleviate the perception that it is only animal lovers selfishly wanting to spoil the pleasure that people, particularly children, get from fireworks. The sale and use of fireworks is incorporated into the national Explosives Act and as such is under the jurisdiction of the South African Police. However, permits for the sales thereof and safety clearance certificates (issued by the local Fire Department) are controlled by each municipality with permits being issued for the premises which may not be used elsewhere. 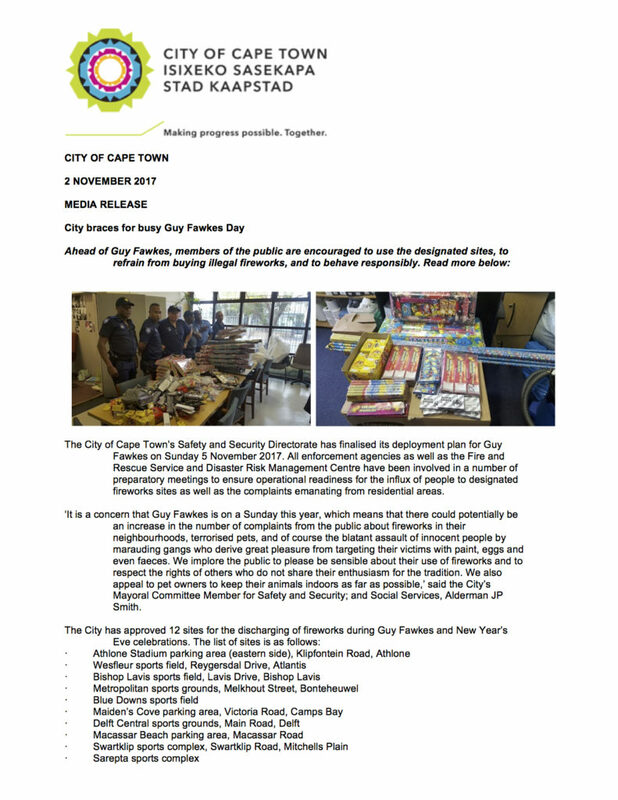 The sale of fireworks anywhere other than permitted premises, at markets or street vendors is illegal. The DA has officially recognised animals as sentient and as per racing dogs some years ago, will more than likely be the party to take this to Parliament for us. We have via Councillor Nicky Rheeder received the contact details of the Shadow Minister of Police with whom we must meet. Nicky has offered her assistance and once we start the campaign would like to be involved. Develop a factual campaign letter. Design a signatory document which must be manually signed and worded so that the form states clearly what the people are signing for. Meet with the Shadow Minister of Police and get his/her written agreement. 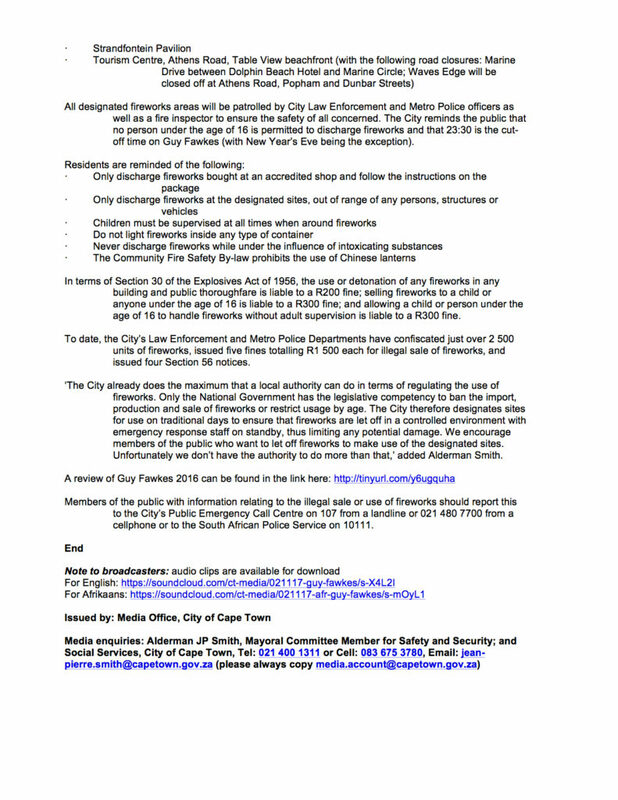 Liaise with the DA to ascertain the deadline for signed objections to fireworks. Get the written support of both the SA Veterinary Council and SA Veterinary Association. 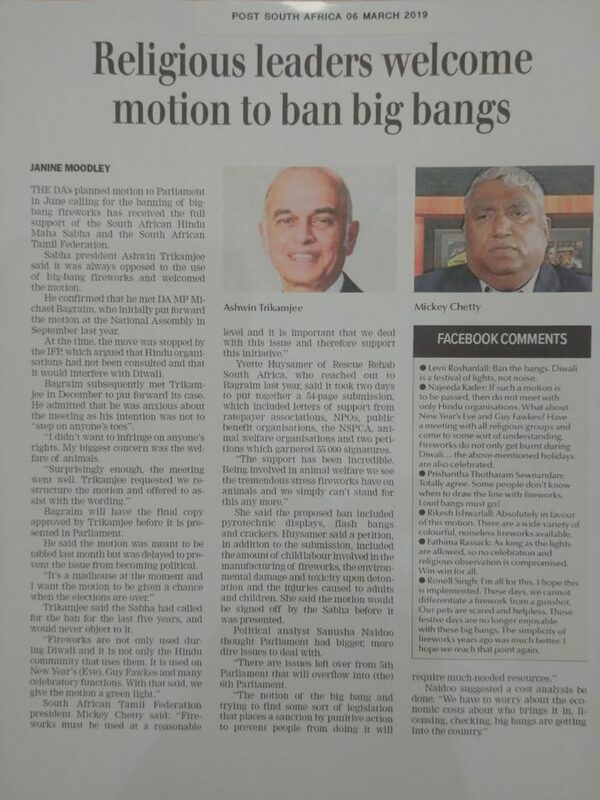 Get the written support of the South African Hindu Maha Sabha – there does seem to be some division with some of the Hindu leaders with some opposed to fireworks (noise) and others wanting to keep fireworks. Obtain the e-mail addresses of as many South African vets and welfare organisations/rescue bodies as possible. Get written reports from vets, doctors, animal owners, rescues and individuals with regards to the types of trauma experienced by injured and killed animals as well as from doctors with regards to injured children. File and count returned signatory forms – some might only have a few signatures on them but it will be simple to have specific lever arch files for making counts easier. Make arrangements to deliver the lever arch files to the DA timeously in terms f the deadline. We will also need to get donated but not sure how many A4 pages a lever arch file holds but will research. We will also need funding to pay for airtime for those involved as this will be a long process possibly requiring numerous calls by the campaign team. In terms of items 1 and 2 coporate companies can donate the use of their labour and heavy duty office printing equipment which will save costs and time. i have 36 000 hand signed petitons to be handed in but the peitions comittee in JHB is a disaster. who do I hand them over to where they can be used effectively?